Saving the World one website at a time! With our reputation based upon customer satisfaction and unique problem solving, Wholahoop Media specializes in small business website design, development, security and SEO needs. No job too small for our attention. Our only goal is helping you get the most out of your website and business needs. Based in the Greater Seattle area, we are a part of your community, and work with small businesses everyday. Search through our services below and contact us with any questions you might have! We design for YOUR business and website! Helping to promote your brand and make your business standout from the rest. Specializing in open source technologies and frameworks such as WordPress, Woocommerce, Bootstrap, jQuery and more. We can help build your web applications faster and better. We use our years of expertise and best practices to help your website reach your audience with proven results for our clients. 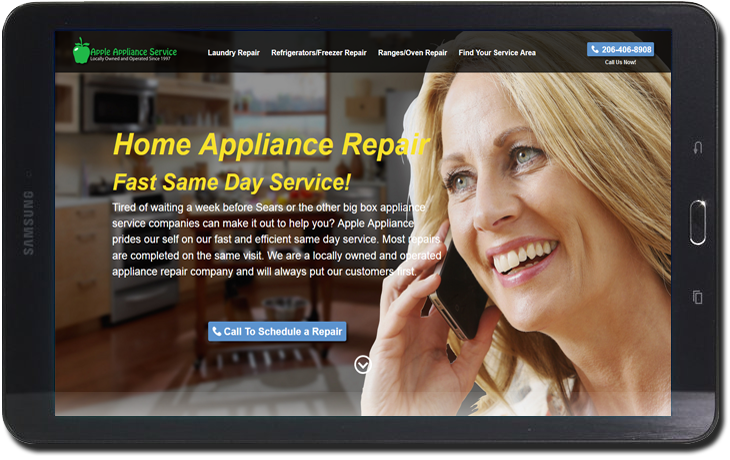 We've just completed a complete mobile-friendly, responsive, new website for Apple Appliance Service. This project included working closely with the client to re-brand their online presence, and from the ground-up SEO to help them reach their customers in over 30 major cities in WA state. You can see the work here! We work with our clients in delivering perfect-fit solutions for their projects. Our creative knack will help to make your business or project stand above your competitors. We utilize cutting-edge tools and supported frameworks to keep your project ahead of the crowd. We help our clients brand their social media presence and create custom banner-ads as well. We utilize WordPress, Drupal and other content management systems to allow you control over your website. Helping our clients extend their reach through proven marketing techniques. © 2013-2019 Wholahoop™ Media, LLC. All Rights Reserved.